Egyptian intelligence sources say terrorist Ibrahim Nasser was on a motorcycle, 15 km. from Israeli border. Intelligence sources in Cairo told Egyptian media that an Israeli unmanned aerial vehicle (UAV) fired at a terrorist in Sinai Sunday and killed him. According to the reports, the terrorist was hit by a missile that was fired at him as he rode a motorcycle in the Bedouin area south of the village of Al-Kasia, about 15 kilometers from the Israeli-Egyptian border. Witnesses said the explosion left a crater two meters wide and 50 centimeters deep. There were two versions of the terrorist's name: some reports named him as Ibrahim Awisa Nasser, and others as Ibrahim Ouda Bereikat. He was was arrested several days ago in the wide-scale operation by Egyptian security forces against the terror network that has developed in Sinai, and subsequently released. 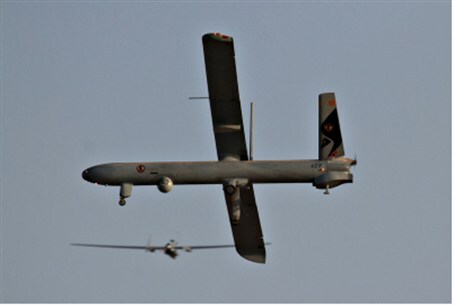 An Israeli UAV was reportedly circling overhead at the time of the blast. However, yet another report quoted Egyptian security sources in northern Sinai who said that they doubted Israel was behind the attack because "Israel would not dare cross the border." They surmised the terrorist was killed by a rocket propelled grenade.